A new 20 lb propane tank is being delivered today. I bought this tank because it contains a built-in gage. My old propane tank uses an add-on gage which does not work well. Before using the new tank, I understand that it must be purged. I'm searching for a place that can do that purging and also check out this new tank for proper operation before filling with propane for the first time. I have just been informed by a propane dealer that all new tanks are now delivered with a negative charge and no longer must be purged. Recall that I was Blogging to you just a few days ago about not knowing when I am hungry? Well, whatever I am doing since then seems to be working! My appetite is back gangbusters! At 24 Hour Fitness, I began using the stair climbing machine. With weights, I do each repetition until failure. Maybe this change at 24 Hour did the trick? "Andrew Jackson - Good Evil & The Presidency"
If you love a great story. If you love the history of our country of the United States of America. You most definitely will love this program! George, I hope you're not disappointed. Looking at the picture you can tell the gauge is just an add on gauge like all the others that don't work. If you google Flame King, Max Meter Technology, you'll see that Amazon sells that gauge by itself for $16 and the review is one star with the comment...."Save your money, it doesn't work." I bought a new 20 lb propane tank a few months ago from a propane dealer. That tank came with a clip-on gage which works great! I'll post here when I test out the new tank which should be arriving today. 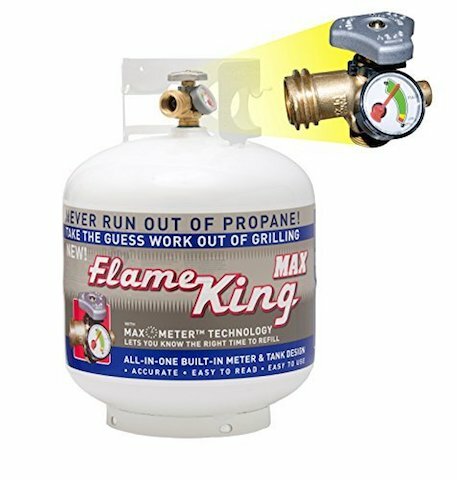 This propane tank on Amazon shows 204 reviews with a rating of 4-1/2 stars!! 5-stars is 100%. Those gauges are snake oil. Only reliable method is to weigh them. This gage is not a pressure gage. I believe that it is an electronic gage that monitors the propane level from inside the tank. If it actually measures the level of liquid it may work.